Just back from my flight with the new software and all I can say is WOW! The %HP fix is perfect.....so now the LOP and ROP pilots are both happy. Also, the probe diagnostic screen was very stable with no flashes of red at al. I am going to play with the "Live G Force" screen a bit more to fully understand it but it seems like it is a great addition to already great product. I'm not totally clear yet on the difference between this screen and the vertical component of the 2 axis turbulence screen. It seems both are going the vertical component in Gs. It is really amazing to see the great changes that keep coming to the G series analyzer. When Insight says it is the only engine analyzer that keeps getting better, it is the truth!!! I plan to post all the new additions on the Socata Website today. I'm sure you'll be interested in the fixing of the 'leaning problem' on our 1968 Cessna Cardinal with the G1 installed. We talked about it over the phone last year. If you recall, when we leaned, the temps continued to rise, even at the point of the engine cutting out. We looked for manifold leakage, carb problems, even changed the jet to a larger size... no luck. We noticed very little rpm drop when pulling carb heat during run-up, not the smoothest running in the air. While troubleshooting we noticed the engine ran smoother on ground with lower cowl off and, we got that little rpm rise just as the engine was shutting down that had always been missing. Finally led us to open the carb heat box on the lower cowl and there it was. Someone had rebuilt the flapper directing the heat either overboard or to the carb. Terrible job, but, the main problem was the geometry between the Carb heat cable and the 'arm' it was attached to which moved the heat valve. It was not possible to close the valve so even though' the lever was pushed all the way in, the carb heat was still 1/2 open at all times. Of course this meant we were running with a very rich mixture, not because of high fuel that could be controlled with mixture but because of lack of sufficient air due to the high tem,phot air. In effect the mixture control was cutting off the fuel and we still were not at best fuel/air ratio. We rebuilt the valve and re-welded the arm so the geometry works, held our breath and... run up perfect, good drop with carb heat check, engine very smooth now in flt, leaning works as advertised. I wanted to give your company some quick feedback on my recent purchase and installation of your G2 GEM in my Piper Cherokee 140 with the Lycoming O-320-E2A power plant. I was fortunate to be able to place my order at Oshkosh. Your sales and technical staff were outstanding and very knowledgeable. The product when it arrived was as advertised and the installation went without any problem. On my very first flight the instrument paid for itself. The CHT indicator for one of my cylinders indicated a hotter than normal temperature. With the data from the G2 and some quick trouble shooting a leak in the exhaust manifold at the cylinder head was discovered as the culprit. The leak was pointed toward the CHT probe and actually heating the external surface of the probe. Left unattended this could have really caused me some real problems at the most importune time. Again, thanks for a great product; I know that I'm going to enjoy it for years to come. I appreciate you taking the time to answer. I am heading out on a very long journey on July 20, and want to make sure I fully understand how to use the G2 properly. As a testimonial, after I installed the G2 last year, I took a long trip from Brampton to Baffin Island and around Hudson Bay. By using the G2 to fly lean of peak – 8 gph instead of 11 gph - I calculated that I saved about $950 in fuel on the one trip. App. 2 weeks ago I have called you to get an idea why one of my 2 G3’s ignores all inputs coming from P2. You brought in your engineer who explained how to open the instrument and that there could be a bad connection between 2 PCBs. This was exactly the issue. I just had to connect the boards and fit in the white plastic spacer. After re-fitting the instrument in the panel, it worked perfectly. Thanks for your serious attitude towards your customers! The more I use them the more I like them, excellent product. This is one area where you guys are lacking. I was surprised that I could find precious little comment on the G series before purchasing. I purchased based on study and my experience with my 610's. I think if you had a web page dedicated to customer feedback it would be a great sales tool. I have to believe that the vast majority of your customers will have very positive comments. I say vast majority because as you know there will be the occasional bone head that will be unhappy no matter what you do. So you have to accept the bad with the good. Well its like anything else it takes a while to get the hang of it. These are really great instruments! What I have found is that with the increased precision, you really do need to have tuned injectors. No my situation worked out really well: I found a dirty injector on #4 on the left. Getting that cleaned up & moving a couple other injectors got me to within .4gph on the GAMI test. On the right side after "musical injectors" I was able to get #1-4 all identical, with 5 & 6 peaking way too late (too rich). Those two have been sent to a shop that does a flow analysis & can lean them out to get them to peak with the others. So next week when I'm all done I'll have each engine with matched fuel flow/peak egt. When pulling back the mixture I'll get all 6 peak boxes nearly simultaneously. Of course the other way to do that is to spend another $800 per engine for GAMI injectors, but my case worked out unusually well and that was not necessary. Thanks for your help. It was very interesting, and at the end I'll have much happier motors. Got it installed, and man do I love it.....noticed right off the bat my #2 cylinder was running slightly cooler on the egt's and discovered a minor intake leak. The egt's are so quick to respond I even found what spark plugs were less than perfect during the run-up.....thoroughly impressed so far. Install was pretty easy and straightforward. I installed the G1 on my personal Comanche 250, but have already recommended it to several others; I think an engine monitor should be required equipment! 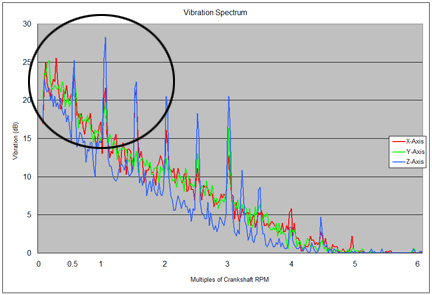 Question: Why would I want vibration analysis on an engine monitor? 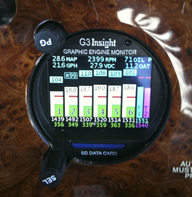 Larry installed an Insight G3 color graphic engine monitor in his Trinidad Socata TB20 last year. "I had used the Excel vibration graphing tool on Insight’s website to print out the vibration analysis data from my G3 over a couple of flights for a baseline benchmark. After flying the G3 for 8 months I also had a new 3 bladed prop installed on my Trinidad Socata TB20 with a Lycoming IO 540. After 90 hours I noticed grease, and had to have the prop pulled and resealed. I was told that the reseal would be covered under warranty but that I did not need the prop balanced again. 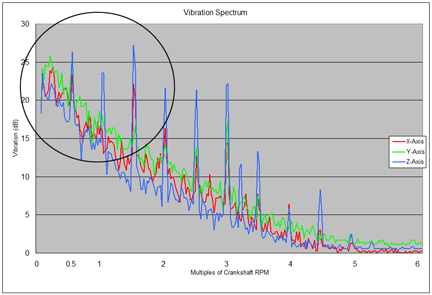 It felt rougher to me, however, so I printed out another vibration analysis which confirmed more vibration after the re-seal than before". I am having my prop rebalanced this morning and will send you a new "after balance" chart as well as a couple more "before re-balance" charts later today. The shop tells me when they balance, they are correcting the vibration in the vertical axis only. I told them the Insight sensor measures in all 3 axis. Do you know if it is the X, Y or Z axis that correlates to the vertical that they are correcting? The Vertical axis is the Z Axis on our sensor. The Left-Right lateral axis is Y. Because the prop spins in a plane defined by YZ, prop imbalance will contribute equally to Y and Z. X is Fore-Aft, and in theory would be relatively unaffected. Note that this definition depends on your sensor being mounted in the same orientation as the pictorial airplane on the sensor itself. If you've mounted it in some other orientation, you will have to translate it accordingly. 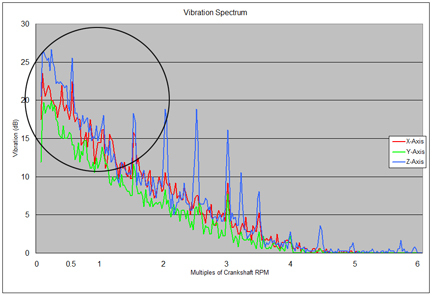 We look forward to examining the vibration spectrums. The prop balance was completed and it definitely feels much smoother. We went from .8 IPS to .05 IPS. I have attached another "before" graph (I believe I had sent you a couple previously) which was taken today prior to the prop balance. The data was done at 2500 feet at 65% power at 100 ROP. The "after" graph was also taken today after the prop balance under the exact same conditions.....2500 feet, 65% power and 100 ROP. The graph improvement for the Z average is pretty dramatic as you can see. I owe this "warranty" prop balance to the evidence supplied by my G3 prior to and after the prop reseal. A new balance was approved under warranty. Answer: A G3 color graphic engine monitor is one of the few things you can put in your aircraft that will actually pay for itself. I recently upgraded my Baron B55 from a GEM 1200 to two new Insight G3 2.25" instruments. These color engine gauges take engine management to a new level at a very affordable cost. The upgrade used my existing probes and wiring for the EGT and CHT sensors and reduced the time and cost of the installation dramatically. I can now see the temperature of every EGT and CHT simultaneously in addition to the color coded bar charts on a crystal clear LCD screen. The lean boxes that show the current EGT variance from peak EGT make the leaning process very simple and easy to monitor throughout the flight. On top of that I get backup instruments for all other key engine data to provide redundancy to my unreliable legacy engine gauges. The Insight G3 instruments make flying my plane even more fun and safer than ever. 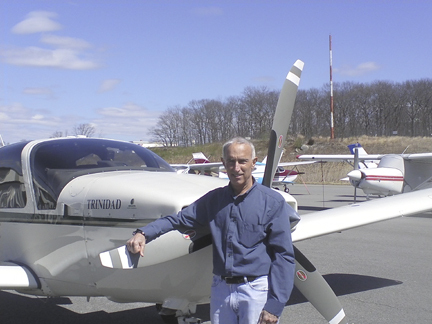 "During my first flight with the G3, I very quickly learned the value of the probe diagnostic functionality. It turned out that this flight was also the first flight with 6 new cylinders on my Cessna P210 so it was intended to be a 2 hour, high power break-in flight On the ground, during run-up, all my EGTs and CHTs looked normal. However, 15 minutes into the flight, the #3 EGT began to show odd and fluctuating temperatures. I was flying with my mechanic and we both believed that we had a probe issue but decided to head back to the airport and land just in case it was something in the new cylinder. Given our newness to the G3, neither of us thought to look at the probe diagnostics page until we were actually on final. Once it dawned on us that the G3 could tell us if we had a probe failure or not, a quick glance at the probe diagnostic page showed the #3 EGT probe at around 90 ohms resistance, an obvious failure. The G3 made it very easy to spot as the data for that probe was displayed in red. Now that we were confident that we had a probe issue and not a cylinder issue, we continued the flight, saving a complete cool-down cycle on the new top end as well as the time to un-cowl and diagnose the #3 EGT probe. Interestingly, back on the ground after the flight, the #3 EGT probe again showed 5 ohms. Clearly this probe was only malfunctioning at high temperatures, making it very difficult to diagnose on the ground. Insight has really touted this feature and I have now had the real-world experience to understand exactly why. Great job, Insight!" New Graphic Engine Monitor from Insight Avionics! It's called the G3 and I have one. It is awsome! It provides more information than you could possibly use and it's only 2 1/4" in diameter! It is STC'd for the Seabee so just put it in and send in the 337 form and your done! Very reasonable price also. Excellent customer service and tech support! I have some time flying behind the G3 at this time. I thought I would give you some feedback. Primary screen is very intuitive and head and shoulders above any EGT/CHT display I have ever used. Leaning has been turned into a process that “even a monkey” can do. Probe diagnostic screen will prove to be great in the future. I was able to see a fouled plug immediately on run up by noticing the CHT of that cylinder dropping relative to the other cylinders. Surprisingly I reference the EGT variation screen occasionally and find it very comforting. As a point of interest, I am burning 1 GPH less than the G3 is indicating. I have spoken with an owner of a JPI unit and he reports the same condition. I have carefully measured how much the G3 is reporting burned out of each tank and then comparing it with the fuel trucks delivery upon fill up. Consistently each tank (I have five) is taking about 1 GPH less than the G3 had reported as consumed. Is this to be expected? Notice that the G3’s count is actually safer as I have more fuel left in the tank than the G3 thinks I do. I must say that I love my G3 and will recommend it to everyone who sees it. Until the “page” knob is upgraded to a better quality component I will have to warn them of this flaw. For the panel space there is no better representation of the engine than your G3. Thanks for producing such an intuitive product and I hope to see it mature as you gain experience with it. And it does give you a warm feeling about the engine. Here is some data from my last trips. Here also is a picture of it mounted in my Malibu Mirage N657MC. I wanted to tell you all that I have flown with the new G-1, which I only have two flights thus far, but it's worked perfectly. I totally love it. It such a nice upgrade from the 602 unit I've used for so many years. I was worried being an older guy that I wouldn't be able to read the CHT and EGT numbers because they are kind of small but the display is so good that it's not a problem. Also the color status on the bars makes for an easy quick scan and having constant EGT & CHT's for each cylinder displayed all the time is really slick. I now have a much better idea just what's going on in each cylinder then I ever had prior. The top box showing the temp diff. Lean or Rich of peak is also really cool and provides a great reference for adjusting the mixture. A really nice job with it and in the end it was well worth the wait.